Host to the WEF, Davos attracts global leaders, government officials, royalty, celebrities, intellectuals and the worlds business elite, who meet annually to discuss how they can best improve the state of the world. 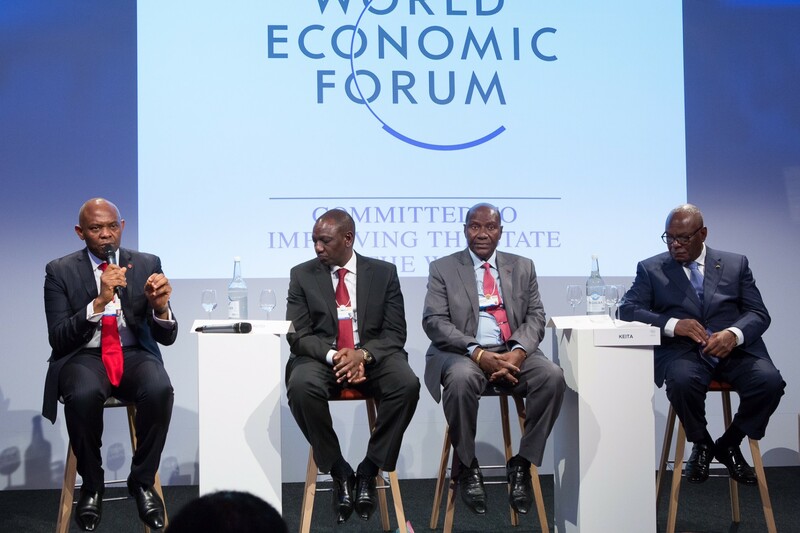 We have provided some highlights on the outcomes for Africa from Davos 2015. Where the Africa agenda was concerned this year sentiment was still positive despite the downside risks, the current view was opitmistic where growth was concerned, with a country-specific observations of growth being applied. There were two types of conversations where Africa was concerned, one focused on South Africa being coupled to the global economy, and the BRICS agenda, and an individual country view, which observed how individual countries are navigating the current challenges. A key focus was on re-thinking Africa’s roadmap for addressing the current gaps and weaknesses, with a fundamental focus on refining reforms from a micro-economic perspective, and the current impact on oil reliant countries, and how they focus on diversifying their economies. The key issues for concern were Nigeria, with focus on Boko Haram, falling oil prices and the up coming election.Concern was raised with regards to the impact the fall in the price of crude oil will have on Africa’s oil-producing nations, and the long-term impact of an increase in production of oil from the US, raising question as to whether Africa will be able to sustain its current growth rate, based on some of the some of current infrastructure projects being attached to natural resource development. Geopolitical risks were highlighted as a cause for concern, inter-state conflicts were deemed to be having greater regional consequences, with questions raised as to whether these risks will overblow the current growth forecasts for Africa, which the IMF have projected as 3.5 and 3.7 percent respectively for 2015 and 2016. The up and coming elections on the continent in the Ivory Coast, Burkina Faso, South Sudan were highlighted as potential causes for concern, with emphasis on larger counties such as Nigeria and Tanzania, and the risk that some presidents may want to extend their tenure. “Although there is a potential risk some presidents may want to extend their tenure, there has been an improved response from other African nations in assisting with such events, helping countries return to stability”. Now a reality faced globally, where Africa is concerned the threat to the continent is mainily presented by Boko Haram and Al-Shabab. This was highligted as part of a wider global problem, and it was stated there was a need to focus on global collaboration to stem the growth in this growing trend. It was advised that the situation with terrorism in Africa was not perceived to be Red in terms of the macro-economic impact, but is being monitored. Focus was being placed on the impact it may have upon specific commodities, with oil prices cited as a prime example, and the impact this may have on global growth. The perception of lack of safety and security and whether this was an impression fulled by the media, or was a current reality where the continent was concerned was also addressed. South Africa’s President Zuma noted there are issues which have arisen since the fall of Colonel Gaddafi, which have destabilised the security within North Africa. Boko Haram is perceived to be a outstream of this, which has arisen due to the manner in which the conflict in Libya was handled. Rwanda’s President Kagame stated that there was a general overlap with regards to reality and perception where the perceived lack of security was concerned. The continent is stable, but does has some security issues, and these issues must be addressed for Africa to progress, reiterating the view that Africa needs to provides the solution to its problems. Head of the Nigerian stock exchange Mr Oscar N. Onyema commented that security isn’t an issue isolated to Africa, and is a concern when investing in assets in general forming part of the overall risk assessment, however where Africa is concerned the current security issues are in isolated pockets. It must be noted that where these issues for concern are located, are not necessarily the geographies which drive the African economy. There is a potential risk, but it is not as big as the media Portrayal. Brent Crude has dipped to a 5 year low, and OPEC, which accounts for a third of the world’s oil supply, confirmed they would not be reducing production to increase prices which resulted in focus on how this will affect African countries which rely on oil as their key commodity to provide government revenue. The market is set to continue its downwards trend, with Brent Crude oil prices breaching $50 a barrel. The high price of Crude Oil has been responsible for rapid growth in some of the continents largest economies, such as Nigeria, Angola, and Libya, economies which are heavily dependant on oil exports for a significant amount of their government revenue, making them particularly vulnerable to market volatility. Weak Brent Crude prices are causing African oil-producing countries to tighten their monetary policies, revise budgets, and devalue their currency, and are having a major impact were countries have failed to diversify their economies. The IMF growth rate was forecast above 5% for some African countries, this could result in the current proposed figures being over inflated, due to the impact of the 50% drop in the price of oil. Albert Essien noted that Ghana and Nigeria were sensitive to the impact of the decrease in oil prices, but that Ghana would have positive and negative impacts. They will see the benefits from the reduced oil prices, were they are a net importer of crude and refined products, and should be able to weather the storm, due to their low production costs. It was noted that Nigeria will be the real challenge. The government from Africa’s largest economy were not in attendance at this years forum, but the cause was championed by two of the continents African Giants, Tony Elumelu and Aliko Dangote who hosted a round table entitled “Unlocking Global Institutional Capital for Africa”, discussing what it takes to build global partnerships in Africa. Tony Elumelu also focused on Policy, highlighting this as a key requirement for investment, stating both regulatory and policy interventions, were required to provide sustainable energy in Africa. CEO Phillips Oduoza, of Nigeria’s United Bank for Africa (UBA) advised that the business is currently plan to invest heavily in infrastructure projects. Weakness in the Naira was also highlighted as a concern, alongside the drop in the oil price, however Nigeria still has $35 billion in reserves which can be used to protect the Naira. The view was also held that the current fall in price will be short-lived, based on the previous falls in price in 2008, it was also viewed that there will not be a further significant drop in the oil price, With the view being that the Nigerian market is adequately protected. UBA will continue their long-term investment in oil projects, as the current fall in the price of crude oil is cyclical in nature and will be resolved. CEO of UBA noted that their operations were not halted by the recent outbreak of Ebola, effected countries are beginning to show signs of recovery and perceive the worst to be over where the outbreak is concerned. Operations in Guinea, Libera and Sierra Leone continued with business as usual during the outbreak. “Public health policies must “transcend politics and borders” Prof Peter Piot. Where Africa’s growth is concerned, South Africa is currently perceived to be the dampener to the African growth story, President Zuma noted that the country were investing in infrastructure, addressing energy issues, and have a national development plan in place. It was noted that the current electricity crisis was being attended to by the infrastructure build and maintenance programme, and that there was a need for a stronger and transformed mining sector. Brand South Africa were in attendance promoting, the major economic sectors of Mining and beneficiation, Agro-processing, Industrial infrastructure, (including telecommunications, energy, water, sanitation and transport), Tourism (primarily hotel and resort development), Health care, Manufacturing, Information and communication technology, and Forestry and related products. With many of Africa’s countries experiencing energy crisis, the issue of sustainable energy solutions is an ongoing challenge for the continent. The forum saw the launch of the “African Energy Leaders Group” which was launched with the objective of creating regional champions who will engage the rest of the regional community into the initiative to enable the continent to build pubilc-private partnerships, leverage political support, and mobilise funds for sustainable energy and development initiatives on the continent. Described as a continent which holds incredible opportunity, as well as considerable risk, 2015 will involve macroeconomic challenges due to the instability of oil and commodity prices, and challenges to the Africa’s banking systems, which will require new regulatory and compliance frameworks. Managing the impact of geo-political risks presented by the Ebola outbreak and Boko Haram, and the proposed perceived threat of contagion, are all issues which will need to be addressed, and form a part of re-imaging Africa.